Sleek and elegant design to easily fit into any environment. 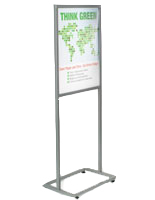 Durable and sturdy metal unit to be used in any high-traffic area. Includes anti-glare lens to protect the graphics from reflection and getting damaged. Double sided to lure passersby from both directions. 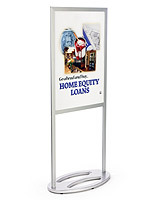 These poster displays, sign frames are easy and reliable for frequent use. 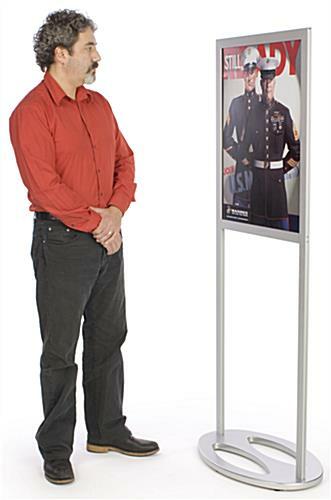 Make your advertisements stand out from the crowd by using these sign frames! Fabricated from durable metal, these sign frames are constructed to last for a long time. These sign frames have a brushed silver finish with a simple design, adding an attractive touch to the graphic displayed. 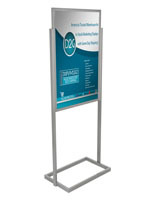 Display any 22" x 28" graphics on both sides using these sign frames. 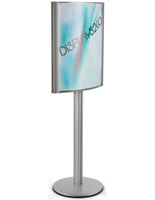 These menu displays, sign frames also allow fast and easy sign changes! Graphics can be slid in and out from the top channel. 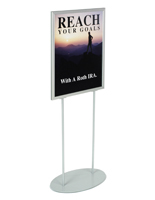 These sign frames, also known as poster stands, have a simple yet stylish design to easily complement any setting. You can use sign frames to display car specifications in a car dealership or even to promote special events in a trade show. The sign frames are so universal that they can even be used to display menu specials in a restaurant! Standing at 66" high, these sign frames are impossible to miss. They are sure to attract the attention of passersby. 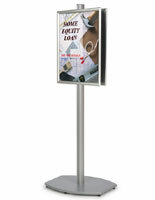 These sign frames utilize only a small footprint to display your advertisements. Let these sign frames do the advertising for you. Place sign frames in any busy area to receive a greater impact. 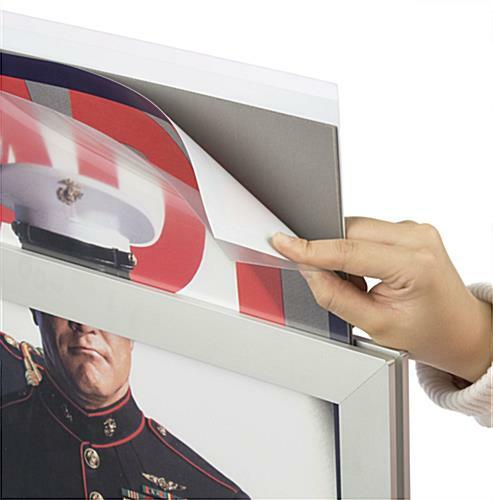 Please Note: Although the frames are designed to hold a 22" x 28" poster, please allow 1/4" on each side of your image to be covered. For indoor use only. 26.5" x 66.0" x 16.0"